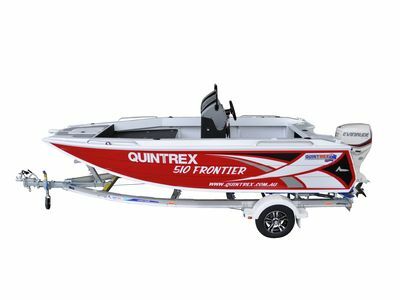 Our Quintrex Frontiers are a built for serious fishers, featuring live bait tanks and under floor storage. 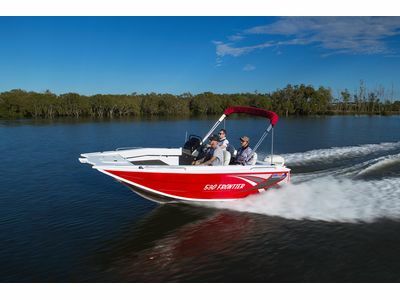 This range of aluminum fishing boats have been designed with increased flared bottom sheet which allows for greater water contact and a smoother ride, making it great for fishing and recreational cruising. If you’re looking for your next fishing boat, take a look at our Frontiers. This little ripper has a maximum 115hp rating making even the smallest model in the range an absolute weapon. The wide chines used on the Apex Hull have achieved increased stability and grip when cornering so you can zip around lake and estuaries. With 4mm bottom sheets and 3mm side sheets across the Frontier range, these boats are built to last. The design features on these boats are endless with underfloor storage, scupper drainage system and live bait tank. 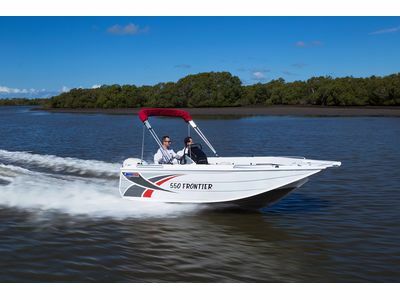 The 530 Frontier is available as side or centre console. This little ripper has a maximum 115hp rating making even the smallest model in the range an absolute weapon. The wide chines used on the Apex Hull have achieved increased stability and grip when cornering so you can zip around dams and estuaries. 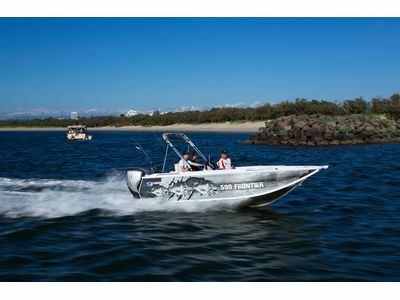 With four stainless steel rod holders and aluminium live bait tank with viewing window, these are some serious fishing machines. The new raised side decks(RSD) features increased freeboard by 80mm and also allows for concealed controls. The new Frontier Console allows pleanty of storage room and increased dash space (accommodates HDS12). Need somewhere to store your fresh catch or plenty of beverages? The casting platform now fits a 47lt or 50lt Evakool and can be optioned up to a whopping 85lt. 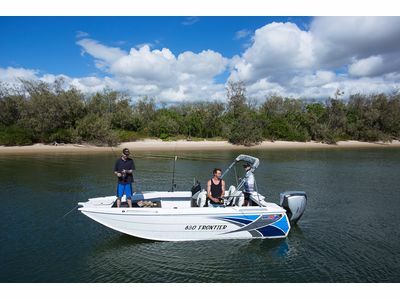 If you fancy doing some water sports as well as your fishing the Frontier offers an optional ski pole/ bait board combination to keep everyone happy. If fishing is your thing, option up to include a bow mount thruster plate to fit an electric motor for easy trolling.